may have been an adult by late 1600’s standards, but considering the parameters I set for this website, she was a child. Not much is known about her, including who her parents might have been. 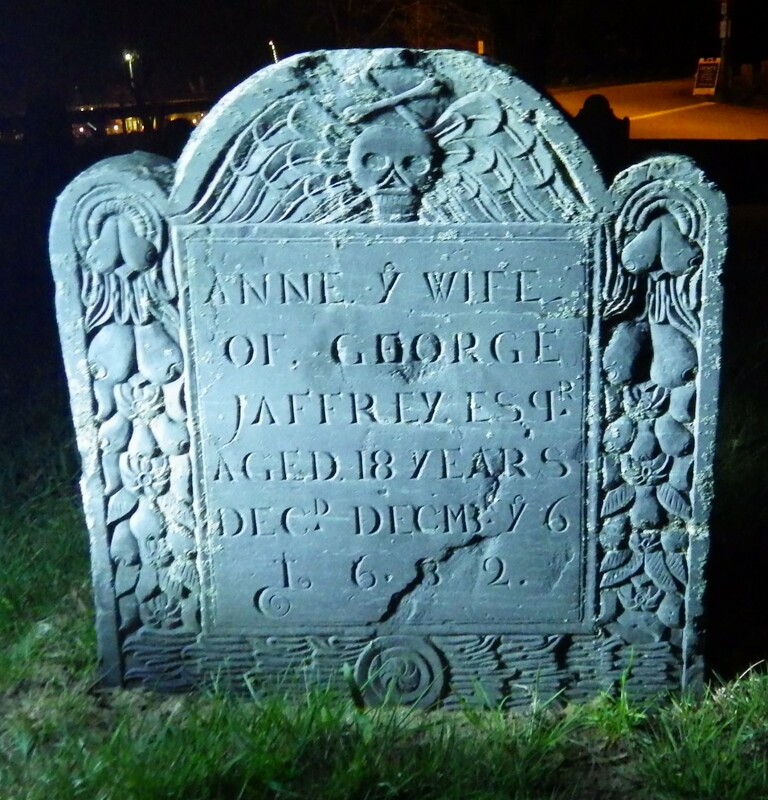 Based on Anne’s gravestone inscription, she was born circa 1664. George Jaffrey was born 1637 in Scotland. He was a Merchant, Ship Owner, and Shopkeeper. George married Elizabeth Walker (1645-1681) on Dec. 7, 1665. They had a daughter named Sarah, born February 26 (or 28), 1666. Sarah married Thomas Hurst, April 14, 1684 in Springfield, Massachusetts. She later married William Perkins, October 1710 in Montreal, Canada. Elizabeth died in 1681. 10, 1682. His wife’s name is Agnes (Anne?) on the deed. George was 44 years of age at the time of this marriage. Anne was 16-17 years old. George’s daughter, Sarah, was 15. Maybe it was common then for [much] older men to marry younger women. There is no information about the marriage or the circumstances surrounding it. I resist jumping to a conclusion based on current standards and ideology. Anne Jaffrey gave birth to a son on November 22, 1682. He was named George after his father. Anne died two weeks later. It is unknown if the death was the result of her giving birth or to some other illness or injury. It is obvious that the child thrived, so if there were any birth complications, they were all maternal and didn’t affect the child. George later married a third time to Hannah Porter (1650-1736) on November 28,1694. He died February 13, 1707 at the house of Colonel Appleton in Ipswich, Massachusetts. Anne Jaffrey’s stone is the oldest currently in the Point of Graves cemetery. It is very ornately carved, possibly by William Mumford of Boston. 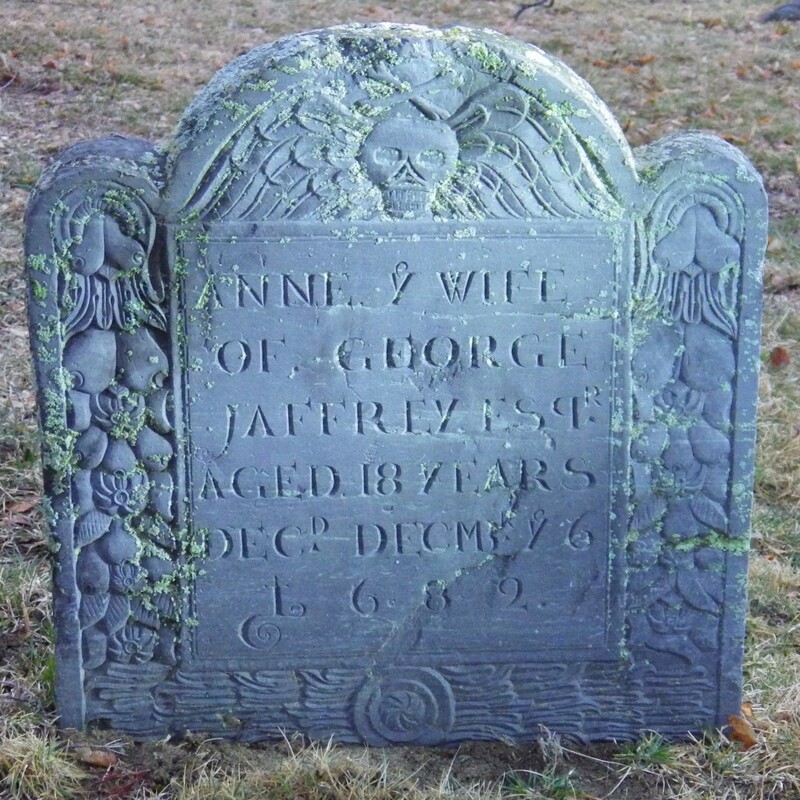 According to Find a Grave, there are no other known Jaffreys buried in New Hampshire. Find a Grave does list George Jaffrey, Jr. as being buried in the Point of Graves, but his stone inscription was not listed in the early 1900 survey of the cemetery.